She shares her bed, food and water with her. 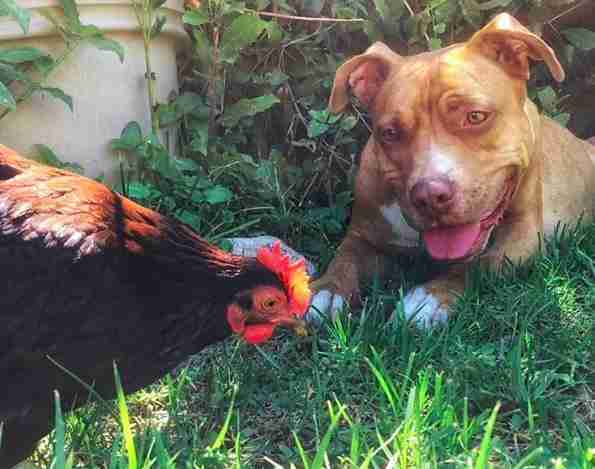 After losing her sister, this rescue chicken was NOT a huge fan of other animals - until she met a pit bull. 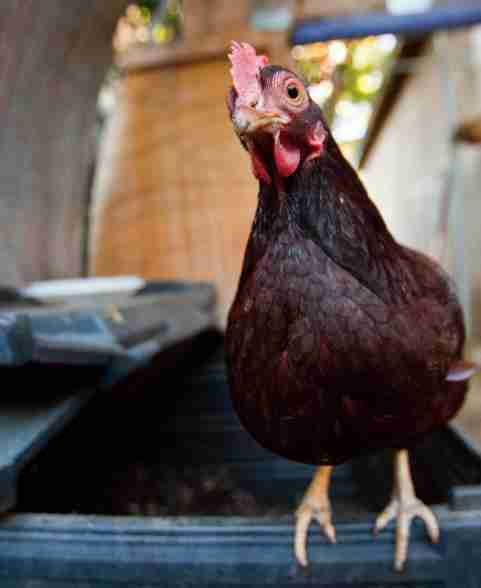 Crystalyn Corso and her husband have always been animal people, and fell in love with their landlord's chicken. 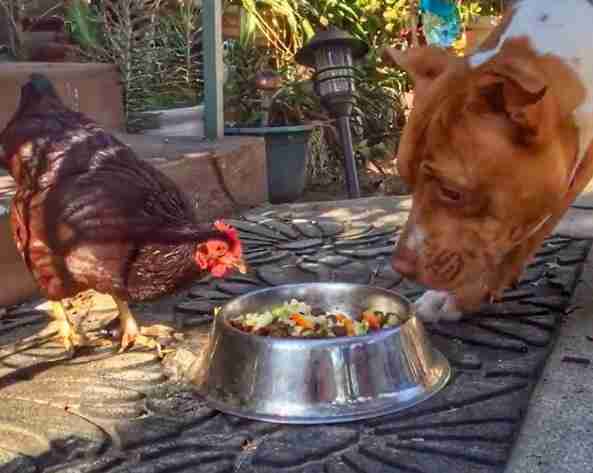 After that chicken passed away, they decided to adopt a rescue chicken of their own. 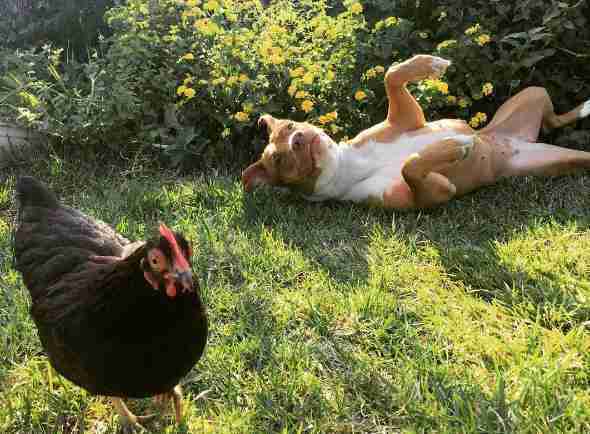 The couple found a backyard breeder in California who could no longer care for all of the chickens he had, and many of them were severely neglected. "When we arrived it was apparent that we had to take the two chickens that needed us the most," Corso told The Dodo. "The farm hand told us, 'If you take these two you will be saving their lives.' So that's what we did." Rosie and Daisy were malnourished and bald when they first went home with their new parents. They had been forced to continuously produce eggs, and had never even been outside before. "The first thing they got to do was have free range in the natural sunshine," Corso said. 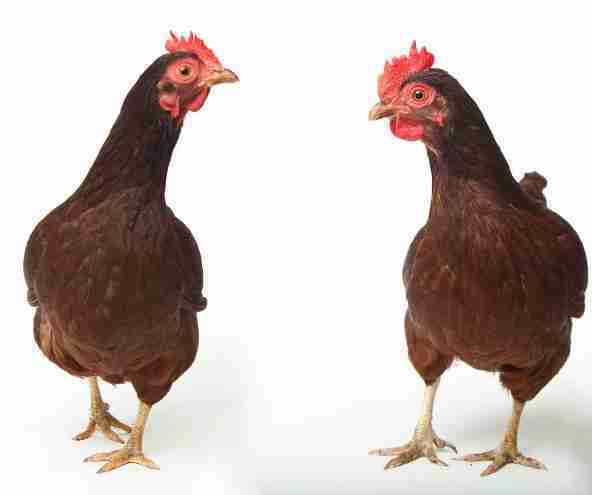 The pair lived with their parents for three years - until Daisy tragically passed away from egg yolk peritonitis, a condition that often affects factory egg layers. "She passed away peacefully and very loved in my arms," Corso said. 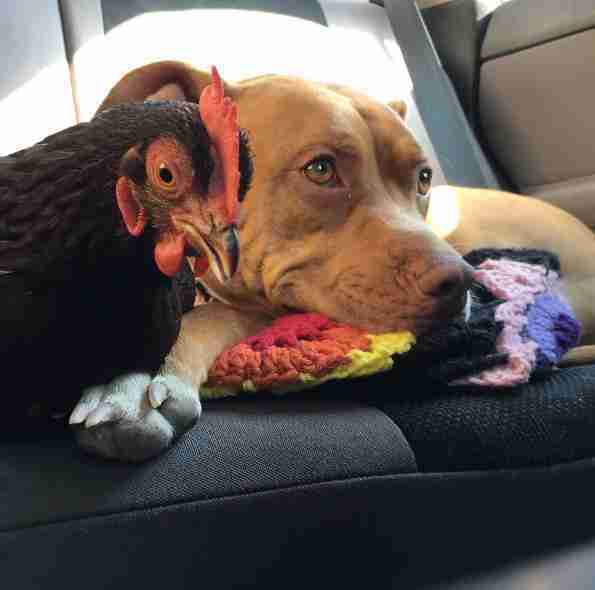 After Daisy passed away, Rosie was left alone, but seemed to like it that way. She would run away from any dogs or cats she encountered, and seemed to have no interest in getting a new sister. Until she met Maggie. 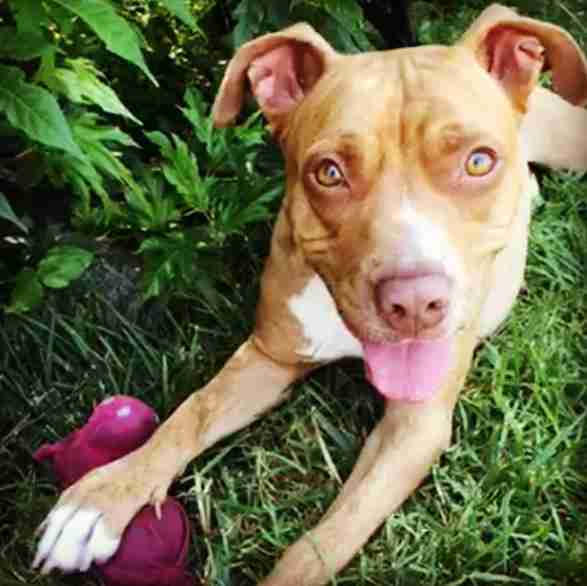 Maggie was found running loose in an industrial area of Compton, California. She was covered in fleas, appeared to have recently given birth, and showed signs of having been hit by a car at some point in her life, and no one had any idea where she had come from. "I wish more than anything that I knew Maggie's complete back story but unfortunately, no matter how many times I ask her, she still hasn't been able to vocalize it," Corso said. When they couldn't locate her former family, Corso and her husband decided to foster Maggie. As soon as they met her they knew they wanted to keep her forever - but only if she and Rosie got along. When Rosie met Maggie, for some reason, she didn't run away. She sat quietly as her mom introduced the two rescue girls, and seemed to know that Maggie just wanted to love her. Before long, the pair cuddled until they fell asleep, and that was that. "They are now best of friends," Corso said. "Rosie appreciates having a new sister to waddle around with, even if she is a different species than her Daisy sister. 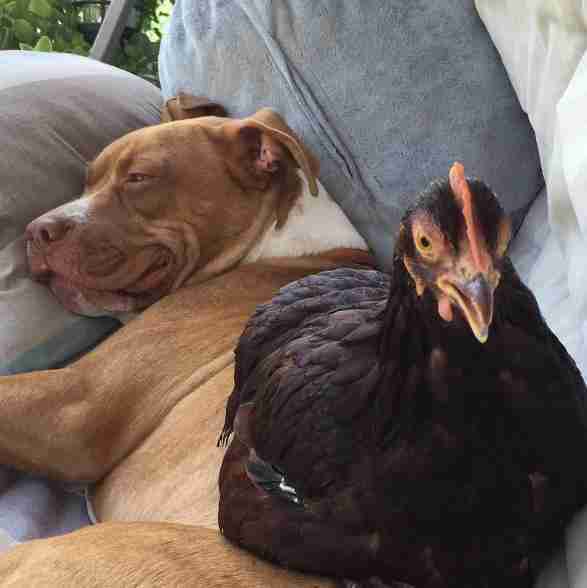 Maggie seems to have adopted the role of chicken protector. She doesn't take her eyes off her sis when they are outside and when they are inside together she lets Rosie steal her beds and food and drink her water." Both Rosie and Maggie came from rough beginnings, and they seem to understand each other so well because of it. 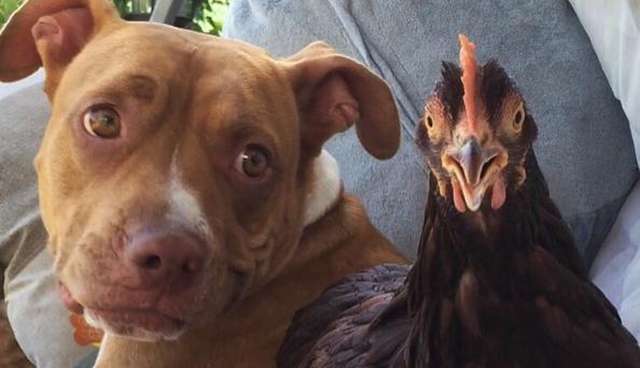 They may be different, but they're best friends, no matter what. You can follow all of Maggie and Rosie's adventures on their Instagram account.